The Microbiome Drug Development Summit continues to be the industry leading forum that focuses exclusively on the development and commercialization of microbiome-based therapeutics; with case-studies from target discovery all the way through to clinical trial development, manufacturing and beyond. Learn, share and collaborate with organizations using novel drug modalities including Seres Therapeutics, Vedanta Biosciences, Rebiotix, Enterome Bioscience, Synlogic Therapeutics, Finch Group Therapeutics and many more. The agenda is carefully designed and structured from start to finish, so that the latest industry insight is integrated in the program in order to tackle the greatest challenges across the entire drug development protocol. With case-studies on using approaches such as “Bugs as Drugs”, microbial derived bioactives and subtractive strategies, this is a great opportunity to get an up-to-date overview of the approaches being applied. With the field still emerging, and regulatory frameworks still being established, learn from the FDA first hand as well unique insight from industry on defining novel regulatory pathways to standardize practice and clarify the route to market. As the microbiome industry accelerates to market approval, learn how companies are selecting accurate patient populations, dosing schedules and establishing clinical endpoints for safe and effective human trials. 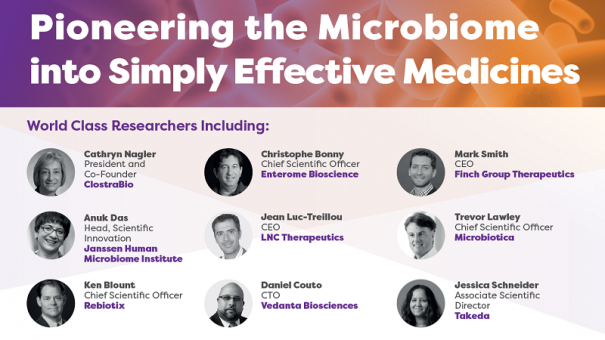 Learn, first hand, how companies are scaling up through cutting-edge GMP formulation and manufacturing protocols when developing microbiome-based therapeutics for clinical trials in order to achieve stability, consistency and improved reliability.